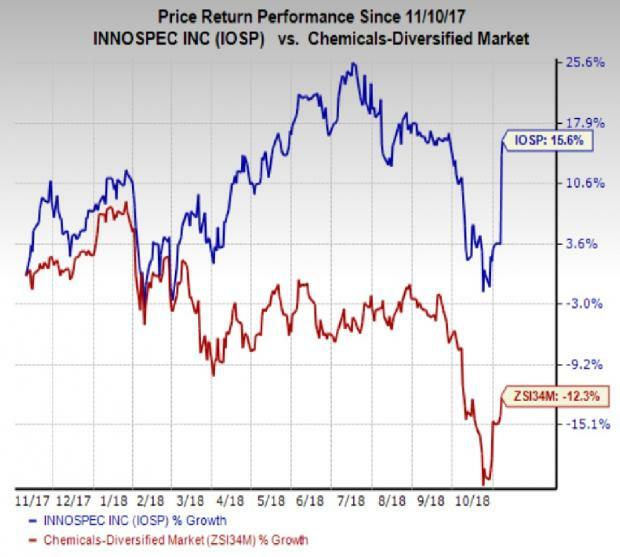 Innospec Inc. IOSP logged a profit of $20.6 million or 84 cents per share in third-quarter 2018, down around 12% from $23.3 million or 95 cents in the year-ago quarter. Barring one-time items, earnings were $1.20 per share (up from $1.00 per share a year ago), which surpassed the Zacks Consensus Estimate of $1.02. The chemical maker’s revenues went up roughly 9% year over year to $363.1 million in the quarter. The top line was driven by sales gains in core businesses. Revenues in the Fuel Specialties segment went up 4% year over year to $134.9 million in the reported quarter on the back of increased volumes and favorable price/mix impact. Operating income was $28.8 million, up 15% year over year. The Performance Chemicals unit raked in sales of $114.8 million, up 4% year over year, driven by higher volumes and positive price/mix impact. Operating income rose 28% to $12.4 million in the quarter. Revenues in the Oilfield Services division climbed 27% to $104.2 million, boosted by increased customer activity, higher volumes and positive price/mix impact. The segment recorded an operating income of $7 million in the quarter, a roughly four-fold year over year improvement. Revenues in the Octane Additives division fell 9% year over year to $9.2 million. The division logged an operating profit of $2.7 million, down 39% year over year. Innospec ended the quarter with cash and cash equivalents of $91.4 million, up around 40% year over year. Total debt was $228.2 million, down around 3% year over year. Net cash provided by operating activities was $34.8 million for the reported quarter, down around 25% year over year. Innospec declared a semi-annual dividend of 45 cents per share for second-half 2018. This equates to an annual dividend to 89 cents per share, a 15% increase over 2017. The company’s board also cleared the buyback of up to $100 million of Innospec stock over the next three years. Moving ahead, Innospec said that it will remain focused on key actions to further boost cash generation in the final quarter of 2018. Innospec is also engaged in acquisition opportunities which the company believes will strengthen its business. Shares of Innospec have gained 15.6% over a year, outperforming the industry’s 12.3% decline. Innospec currently carries a Zacks Rank #3 (Hold). A few better-ranked stocks worth considering in the basic materials space include Methanex Corporation MEOH, CF Industries Holdings, Inc. CF and KMG Chemicals, Inc. KMG. Methanex has expected long-term earnings growth rate of 15% and sports a Zacks Rank #1 (Strong Buy). Its shares have gained 28% in the past year. You can see the complete list of today’s Zacks #1 Rank stocks here. CF Industries has expected long-term earnings growth rate of 6% and carries a Zacks Rank #1. Its shares have rallied 44% in a year. KMG Chemicals has expected long-term earnings growth rate of 28.5% and carries a Zacks Rank #2 (Buy). Its shares have gained 44% in the past year.